After much lobbying by the 9-year-old, and with even more nagging from the 6-year-old sous chef, there will be a stuffed turkey at Chez Tutor tomorrow. I've never stuffed the turkey, being raised in the tradition that dressing baked in its own goodness was the proper way to do things. However, a recent episode of The Barefoot Contessa featured a stuffed, trussed and roasted bird, and the two main turkey eaters in the house decided that's what we needed. I'll still be putting the bird in to brine this afternoon. I'm going to use the savory stuffing recipe we ran in last Wendesday's Your Table for the filling. With any luck, the moisture from the brine and some oven love will turn out a fabulous holiday centerpiece. Other things that the younguns decided we'll have: homemade cranberry sauce, peas, green beans, sweet potatoes, mashed potatoes, pecan pie, pumpkin pie, gravy and cornbread. I won't have to cook for a week. While holiday temperatures can reach into the seventies or eighties as they do in Texas, you can still whip up a cool holiday treat without having to turn on the oven! Try one of The J.M. Smucker Company’s two limited edition ice cream toppings flavors – Smucker’s Pumpkin Spice and Smucker’s Magic Shell Cherry toppings. Whether poured over ice cream or as a topping for your favorite no-bake cheesecake, these limited flavors are sure to be crowd pleasers this holiday season. Try the Pumpkin Spice or Magic Shell Cherry toppings over this easy no-bake cheesecake made with Sweetened Condensed Milk. In large bowl, beat cream cheese until fluffy. Gradually beat in sweetened condensed milk until smooth. Stir in lemon juice and vanilla. Pour into crust; chill 4 hours or until set. Top with desired amount of Smucker’s Pumpkin Spice and Smucker’s Magic Shell Cherry toppings. Store leftovers covered in refrigerator. I haven't seen serrano ham locally, but it's truly one of the culinary jewels of the porcine world. From the Consorcio de Jamon Serrano Espanol, here are some quick recipes for the holiday season. Because of their richer and fuller flavor, these all natural air-dried cured ham prepared with centuries old artisan traditions and techniques require less to deliver more delicious flavor. Making a holiday party a sensation couldn't be easier with tasty tapas made with Serrano ham. It's no wonder the Serrano trend is rising, with more and more restaurants and home cooks serving them. Here are three simple tapas recipes made with Serrano hams from Spain that can be made in less than 5 to 20 minutes each. Remove the stem from the mushrooms, clean them and set aside. add small chunks of Jamón Serrano del Consorcio and stir in the pan. Use this mixture to stuff the mushroom heads and place them in a baking dish. Add salt and pepper and pour olive oil over them. Place them in the oven for 10 minutes at 170º C.
Other vegetables can be substituted, such as green or red peppers, zucchini, asparagus, etc. Smash the pine nuts and brown them in a frying pan. Clean and cut the chives. Mix it all with the fresh cheese. Spread the mixture on the ham slices and roll up. For a more intense flavour, it can be browned in the oven for 2 minutes. The Consorcio's Serrano, Zucchini & Pepper "Tapa"
Mash the piquillo peppers with a bit of oil and salt. Clean and cut the zucchini in slices. Grill them. Arrange the dish: Spread the piquillo pepper cream on the bread, then add the zucchini and a slice of Jamón Consorcio-Serrano. The tapas can be seasoned with a dressing of olive oil and diced black olives. For creams, Eggplant caviar, artichoke cream, tapenade (olive relish), tomato, etc. I confess this isn't an area of expertise for me. My children are food freaks and will pretty much give anything a go. Audrey and her sister Valerie, both preschoolers, have drawn a line in the sand -- Audrey doesn’t eat vegetables and Valerie only eats foods that are white. However, with Thanksgiving and the holiday season just around the corner, Audrey and Valerie will be introduced to many new foods that will challenge their taste buds (and their parents’ patience) -- turkey gravy, cranberry sauce, cornbread stuffing, candied yams, spiced crabapples, acorn squash, and pumpkin pie. So the question is, will they eat it? And, what can parents do to introduce their picky eaters to new foods and tastes to avoid a meltdown at the Thanksgiving table? The Department of Agriculture’s Center for Nutrition Policy and Promotion (CNPP) has come to the rescue with its new website MyPyramid for Preschoolers designed specifically for parents and caregivers. This new, interactive website, found at MyPyramid.gov, provides unique, individualized nutrition guidance to meet the needs of preschoolers 2 to 5 years of age. · Set reasonable limits for the start and end of a meal. When you see that your child is no longer interested in the meal, excuse him or her from the table. · Encourage your child to try new foods. But, don’t lecture or force your child to eat. · Talk about fun and happy things. Try to make meal-time a stress-free time. · MyPyramid Plan where users can create a customized eating plan. · Growth During the Preschool Years answers the question -- Is my child growing the way he or she should be? · Developing Healthy Eating Habits provides parents and caregivers with what they can do to help children develop healthy eating habits. · Physical Activity provides answers to questions about physical activity for preschoolers and provides tips to help them be more active. · Food Safety provides information on keeping foods safe to eat. · Sample Meal and Snack Patterns help translate the “MyPyramid Plan” into individual meals and snacks. Developed by CNPP in collaboration with Team Nutrition of the Food and Nutrition Service, this new website provides nutrition guidance consistent with current scientific research and the 2005 Dietary Guidelines for Americans. The subject areas and content were identified and developed with assistance from a wide array of experts from the USDA, Health and Human Services, academia and related research fields. The interactive components can be found in the MyPyramid Plan and Growth sections of the website. They include a customized MyPyramid Plan, Body Mass Index (BMI), and Height-for-Age charts. The personalized MyPyramid Plan provides a general guide for what and how much to offer daily from each of the food groups. The BMI and Height-for-Age results are calculated and displayed on a printable, user-friendly graph. The Old Farmer's Almanac Everyday Cookbook is a trove of practical everyday recipes. They're good this time of year for their hearty simplicity. This dish can be made with crumbled bacon or shrimp, sautéed mushrooms or leeks, and just about any kind of bread, including raisin or a mixture of white and whole wheat or rye. Prepare it a night ahead. 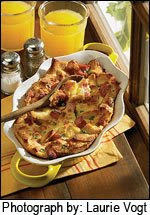 To feed a crowd, double this recipe and prepare it in a large baking dish. Cut the bread into cubes. Generously grease a 13x9-inch baking dish. Make a layer with half of the bread cubes, arranging them so that they cover the bottom of the dish. Sprinkle with ham, cheese, shallots and basil over the bread. Cover with the remaining bread cubes. Beat the eggs and milk together in a large bowl, and season with salt and pepper. Slowly pour the mixture over the top bread layer, saturating it evenly. Cover and refrigerate overnight; the bread will soak up the liquid as the mixture stands. Preheat the oven to 325ºF. Uncover the strata and bake for 1 hour, or until puffed and lightly browned. Makes 8 to 10 servings. Michael Symon is probably my favorite Iron Chef to watch, which is why it irritates me that he gets to compete so infrequently. I think his personality is a hoot, and he just looks as though he's having such fun out there. Here are some hearty winter soups that hopped across my radar this a.m. from the Wisconsin Milk Marketing Board . Chef Symon's creations are always sophisticated twists on old favorites, and this collection is no different. 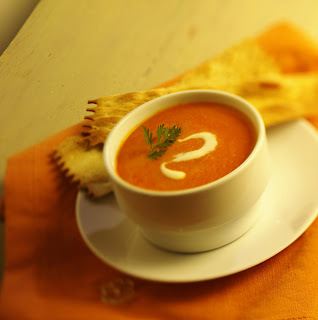 According to Mintel Menu Insights, sales of soup in the U.S. will reach an estimated $5.4 billion in 2008, a 26 percent increase since 2002. Place shallots and garlic in olive oil in deep sauce pan, and lightly salt. Cover and cook gently for 3 to 4 minutes, covered, until limp but now brown. Add carrots and continue to cook, covered, for 10 minutes over medium low heat. Add curry paste and chicken stock and simmer, uncovered, for 1 hour. Remove soup from heat and pour into blender beaker or food processor bowl; blend until smooth. Return to heat and bring to simmer. Whisk in Mascarpone cheese. Serve immediately in soup bowls. Trim the leeks and cut off the leaves and save. Slice the leek bulbs and add to the sliced onions.In a large heavy skillet, heat the olive oil. Add the butter and wait until the butter foams and begins to turn nutty brown. Add the sliced onions and leeks. Cook over a high heat to brown the onions nicely. Add the beer and reduce by half. Add the stock and simmer 6 to 8 minutes. Season with salt and fresh ground black pepper. Ladle half the soup, a little at a time, into blender and puree. Combine the pureed soup with the simmered soup.Cut the wild leek leaves into thin chiffonade and stir into the soup. Ladle into bowls, top with sour dough croutons and generously lay the shaved Pepato over the soup. Over medium heat, in a heavy bottomed sauce pan, heat butter until melted. Stir in onion and celery, cover. Cook 3 minutes or until translucent. Stir often to prevent browning. Stir in flour to thicken. Cook until it bubbles. Slowly stir in warm milk, mixing until thickened and smooth. Bring to a simmer (do not boil) and continue stirring. Reduce to very low heat and add Wisconsin Cheddar and Wisconsin Gouda cheeses, white pepper and hot sauce. Stir until well blended. Add ham and chives. Substitutions: Beer or non-alcoholic beer could be used instead of milk. It's gray out there today, people. Forget the runup to Thanksgiving. I need chili. The door slides shut on the van, trapping the scent of seasonings wafting from the hot pot tucked away to the rear. By the time we reach the end of the drive, the smell is stronger. Its unmistakable warmth slips to the front and wraps around and under the seats. "Oh," he says, sniffing. "That's Nana's chili." A deep breath. "We having that for dinner?" This particular pot of chili is bound for the office, but its recognition to my boy carried the imprint of my childhood home. It reminds us of the classic flavors of our childhood that stay with us, always. Take my son, for instance. He's spent almost all of his eight years eating the tomatoey, spicy, peppery chili of the South. Its smell is generic to him, and it resembles chili made in most parts of the United States. Good stuff, and I know when he's older, the "chili" trigger of his olfactory senses will likely default to tomatoes and cayenne. Give him 10 seconds in a car, though, and his mind flips to winters past and cold nights bundled under a blanket on his grandmother's couch. The "chili" label is refined to "Nana's Chili," an elixir of cinnamon and cloves, nutmeg and ginger usually found only in the lee of the Ohio River Valley. For me, it triggers memories of PTA chili suppers, tobacco festivals and a cramped concessions stand at the football game on Friday nights. He reacts to it the same way his sister can detect bread pudding or slow-baked sweet potatoes. It's home, and home should smell good. Scientists have known for years that the memory of smell is a powerful thing. We build up a storehouse of memories from an early age and pull from them the rest of our days. Some scents are utilitarian - bacon, coffee, coconut. Others, like Nana's chili, are specific to one place, one person, one point in time. The past few years have brought an emphasis on foods cooked at home. This section each Wednesday is devoted to the art and craft of home cooking. I'm not pushing the Rockwellian example of the family table as savior to all of society's ills. Indeed, most family dinner times reveal themselves as more Keystone Cops goofiness than Leave it to Beaver Americana. However, I know it costs less to eat at home. I know that when I make something, I have a pretty good idea of what's in it. When my husband makes something (usually a mean bowl of oatmeal), our children learn that cooks come in all shapes and sizes and sounds. Most important, they make connections that, some day, will be precious. I've trolled some families' recipe files to find those scents that stay with us. Clip'em. Save 'em. And add them to the list of things to pass on to others. This is a great recipe to clear out the spice rack. It cooks a long time, so the flavor changes, and that's also why it takes dried spices and herbs. Adjust any seasonings and spices about an hour before serving. In a large skillet, cook the bacon and the chopped onion and bell pepper until the onion is clear, about 5 minutes. Put the onion and pepper into a 7-quart Crock-pot; save the bacon and drippings in the skillet. Break up the ground beef and put it in the skillet with the bacon. Brown it; drain it. Toss the bacon in the trash (or snack on it), then add the ground beef and remaining ingredients (except the spaghetti) to the Crock-pot, along with one tomato can full of water. Put the lid on, turn it on low for about 8-10 hours. An hour before serving, turn the Crock-pot to high and taste the chili to see what it needs. Break the spaghetti in half and stir, without breaking, the noodles into the chili. Leave it on high, and they'll cook in time to serve. Stir gently to make sure the noodles don't stick together. Just before you get ready to go to work, or about four hours before serving, turn your cooker to high. Allow heat to build for at least 30-40 minutes, then take the masa flour and mix with COLD water to make a paste that has the thickness of molasses. Whisk the paste quickly, directly into the hot chili; stir well. Add the tomato paste and mix well. When you get to work, turn the pot on low for a bit, give it a stir, and wait for lunch. Brown ground beef and drain grease. Pour beef, tomatoes, tomato sauce, chili beans and bullion cube into slow cooker. Drain black beans and great northern beans. Pour all of black beans and half of northern beans into cooker. Pour about 6-10 drops of hot sauce into mixture. Stir. Season with spice powders to taste. Allow to cook on low for about six to eight hours, stirring periodically. About one hour prior to serving, boil rice and mix two-thirds of the rice into the cooker. Serve with cheese and crackers. Cut the chuck into 3/4-inch pieces, or, to save time, have your butcher do this for you. Place the chuck in a large bowl. Season liberally with pepper (about 20 turns of the pepper grinder) and grey salt to taste- remember half of this will come off in the pan. Season with 1/2 teaspoon of the cinnamon, 1 teaspoon of the cumin and 2 tablespoons of the chili powder. Mix this well and coat the meat with the masa harina (this is a ground hominy flour common to Mexican cuisine and easily found in the Mexican food sections of many grocery stores). The flour will thicken the sauce and give it a specific, Mexican taste. Preheat a cast iron Dutch oven on the stove over medium high heat. Add the olive oil and then the coated meat, spreading it evenly so it covers the bottom of the Dutch oven in 1 layer. Leave it alone, without turning it, so the meat will brown and caramelize. Meanwhile, add the lard. The meat has a lot of moisture in it, so a good amount of steam will come from the pan before it is caramelized. As it browns, slowly turn each piece with tongs. Once all sides are caramelized, remove the meat from the pan with a slotted spoon and place on a cookie sheet to cool, leaving juices in the Dutch oven to saute vegetables. Add the onions and garlic and saute for 5 minutes over medium heat until they start to caramelize and get soft. Add the jalapenos and allow to cook for 2 more minutes until soft. Add the tomato paste. Some of the same spices as were used on the meat will be used in the sauce. Add the remaining 2 teaspoons of the cumin, 1 teaspoon of the cinnamon, the oregano, and 2 heaping tablespoons of the chili powder. Add beer. Stir to incorporate everything. Add diced tomatoes, and stir. Then add the reserved meat. Add chicken stock. Simmer for 11/2 hours until meat is wonderfully tender. Strain juice from the black beans, add the beans to the chili pot and bring up to simmer. Then add chunks of bittersweet chocolate. Stir until it melts. Serve immediately or store in the refrigerator for 2 to 3 days. Heat the oil over medium heat in large saucepan. Brown the meat in the oil, then drain excess oil. Return meat to saucepan over medium heat and add onion, bell pepper and garlic. Simmer for 5-7 minutes or until vegetables are soft. Place meat and vegetables in large slow cooker pot and add remaining ingredients, stirring well. Cook over low heat for 8-10 hours, or high heat for 4-5 hours. Serves about four people. Recommend double batch for large gatherings. In large soup pot, saute the onion in the olive oil until tender but not browned. Add chilies, cumin, and oregano. Continue cooking over low heat for about a minute, stirring constantly. Add beans, chicken broth, chicken and cheese. Cook over medium-low heat until cheese melts. Brown the ground beef and drain well. Add remaining ingredients except cornstarch. Simmer for 30 to 40 minutes, stirring occasionally. Skim off excess grease; remove bay leaves. Add enough water to cornstarch to make paste that will pour. Add to chili; allow to thicken. According to Chris Witt, an executive speech coach with more than 25 years of experience, the first thing to remember is the intent of a toast onThanksgiving, which is something like the intent of the meal itself - to bring everyone together in a spirit of gratitude. "The basic things to avoid when making a holiday toast are these: Don't go too long, don't try to be humorous and don't make anyone feel excluded." Tough economic times and cold winter weather sparks a desire for traditional, easy-to-prepare comfort food for many American families. Created by the food editors of The Old Farmer’s Almanac, the Everyday Cookbook is packed with delicious recipes that are all family favorites for generations. This collection contains 425 recipes that call for a short list of inexpensive ingredients. Serve this warm with applesauce or whipped cream, or dusted with confectioners' sugar. Grease an 8-or 9-inch square baking pan. In a large mixing bowl, combine the oil and brown sugar. In another bowl, sift the flours together, then add to the brown sugar mixture and stir until well blended. Add the milk, eggs, and molasses and stir to blend. Fold in the ginger. Pour into the pan. Bake for 30 minutes, or until a tooth-pick inserted into the center comes out clean. Makes 9 servings. Preheat the oven to 325°F. Prick the bottom of the pie shell with a fork in several places and prebake for 15 minutes; remove from the oven, then increase the oven temperature to 375°F. Layer the potatoes, ham and then cheese into the shell. In a medium bowl, beat the eggs and milk together, and pour the mixture into the shell. Bake for 30 minutes at 375°F. Reduce heat to 350°F and bake for an additional 10 minutes. Makes 6 to 8 servings. The Old Farmer’s Almanac Everyday Cookbook is available for $24.95 in retail outlets and the food section of bookstores, and at Shop.Almanac.com. Rick Browne, internationally known BBQ chef; author of The Best Barbecue on Earth and half a dozen other cookbooks; restaurant critic; and host of public television's Barbecue America has the recipe for some great Thanksgiving sides- each with a unique international twist. Prepare a charcoal or gas grill for indirect grilling (it is not necessary to use a drip pan with this recipe). Preheat to 350 degrees F. Make sure the grill rack is clean and oil it thoroughly with a nonstick cooking spray. Spray a 10-inch cast-iron skillet with cooking spray and set aside. Lightly brush the tomatoes, bell peppers, onion, and zucchini with olive oil. Place the vegetable on the grill rack and cook over direct heat, turning several times, until vegetables start to brown on the edges but are still firm. Keep vegetables separate on the grill as the zucchini will be finished first, then the tomatoes, then the bell peppers, then the onions. Set aside until cool enough to handle. Remove the skins from the tomatoes and peppers, and cut all the vegetables into 1/2-inch pieces. Drain the tomatoes on paper towels. Transfer the vegetables to a large bowl. Add the basil, thyme, garlic, salt, and pepper, stirring to combine. In another large bowl, whisk together the eggs and milk, stir in the sardo cheese, and add the mixture to the vegetables, stirring to combine. Pour into the prepared skillet. Sprinkle the top evenly with bread crumbs and the Parmesan. Transfer the skillet to the barbecue and cook over indirect heat until the edges of the mixture are browned and the center is set, about 20 minutes. Let cool to room temperature, cut into wedges, and serve. Soak 12 - 16 bamboo skewers in water to cover for 30 minutes. In a large shallow dish, combine the soy sauce, ginger, rice, vinegar, and oil, and set aside. Transfer the sweet potato slices to a small saucepan and add the water and a pinch of salt. Bring to a boil, lower the heat, and simmer for 10 minutes, until the slices are just starting to become tender. Remove and pat dry. Add the onion, potato, and tofu slices to the soy sauce mixture, carefully tossing to coat. Let stand for 10 to 12 minutes. Drain the vegetables and reserve the marinade. Run 2 soaked skewers, 1 inch apart, through each slice of onion to hold the onion together on the grill. Set aside. Preheat a charcoal or gas grill to 375 degrees F. Make sure the grill rack is clean and oil if thoroughly with nonstick cooking spray. Transfer the onion, potato, and tofu to the prepared grill rack and cook for 2 to 3 minutes per side, generously basting with the reserved marinade, until they are grill-marked and beginning to brown. Transfer the tofu and vegetables to a serving plate, removing the skewers from the onions. Serve over the steamed rice and season with salt and freshly ground pepper. When Peter Durand patented the first metal can for the British Navy in 1810, he overlooked one important point - how to get the can open once it was sealed. "The first cans were made of solid iron and they were heavier than the food inside the can," explains Elizabeth Pearce, senior curator, Southern Food and Beverage Museum. "To get the food out, one literally had to use a hammer and chisel." Pearce says that it was only when thinner cans were created in the 1860s - nearly 50 years later - that a can opener could be invented. "The first can opener was created by Ezra Warner of Waterbury, Connecticut, in 1858," she says. "It looked somewhat like a bent bayonet and you had to jam it into the can and then forcibly rotate around the edge of the can. It was difficult." This wasn't the only problem. "People did not have this type of can opener in their homes," says Pearce. "It was only in stores, so the cans were opened by clerks in the store before the customer left." The Southern Food and Beverage Museum faces a similar situation as the British Navy - it has thousands of cans but no can openers. "We have an exhibition titled 'Canstruction,'" says Pearce. "Every year, architecture firms throughout the country participate in a competition in which they create sculptures out of canned goods. The sculptures are disassembled and donated to a local food bank. We have a can sculpture on exhibit in the museum. We are creating a companion exhibition of historic can openers to compliment the can exhibition. We are seeking vintage can openers to put into the display and into our collection." The museum is looking for can openers that are both historic and commonplace examples of the past. · Old can openers that are wall mounted. · Openers that consist of one piece or of multiple pieces. · Openers that feature the classic wheel design. · Openers that have unique features and advertising slogans. · Examples of old electrical can openers - the first electrical version was created in 1931 though it reached mass market in 1957. · Old cans, such as the original heavy examples made of iron. "The use of can openers didn't really become widespread until roughly 1930," says Pearce. "But there are older versions that deserve to be placed into a museum collection. For example, during the Civil War, Union troops received Warner's can opener along with their rations of canned food. In 1866, a man named J. Osterhoudt patented the tin can with a key opener that we see with sardine cans." Pearce says that can openers are important artifacts that document the culinary history of man. "At the Southern Food and Beverage Museum, we get excited about things like can openers," laughs Pearce. "They are valuable in that they provide a picture of where we have been and where we are going." Those who make donations will be recognized in Southern Food and Beverage Museum publications and on its website/email newsletters. In some cases, donations as well as shipping costs may be eligible for tax deductions when donors get the appropriate appraisals from independent sources. If this was a 1980s sitcom, the Wednesday edition of The Star's food section would be billed as A Very Special Your Table. To put it mildly, we're bringin' it for the Super Bowl of Cooking next week, Thanksgiving. Our theme is The Simple Feast. We've got a wide selection of recipes -- from bird to bread and all ports in between -- that will make Wednesday's food section the only thing you'll need to get an easy repast. (Really. Some of y'all have hassled me when I've called stuff "easy" and apparently it wasn't; this time I mean it.) We've got a budget party for folks who don't want a big spread, but we've also got a checklist for people who are having all manner of kith and kin to the table and need to organize entertainment, seating .... and whatnot. How simple is some of this stuff? Our own staff members brought some of their favorites to the office Friday for a taste test, and, as the columnists would say, "A good time was had by all." Prudence Hilburn kicks in a few of her classics, and Pat Kettles and Ben Cunningham tell you what to drink to make all of these flavors of fall come alive. We're fortunate enough to be plugged in to the Old Farmer's Almanac and their trove of cool recipes that really bring homemade goodness to the table. Here's a sweet treat. Preheat the oven to 350 degrees F. Grease and flour two 9-inch round cake pans. For Cake:In a large bowl and with an electric mixer, cream the butter and sugar until fluffy. Add the eggs, one at a time, beating briefly after each and then until the mixture is as light as whipped cream. In another bowl, sift together the flour, baking powder, and salt, and set aside. In a small bowl, blend the milk and extracts. Alternately add the dry ingredients and the milk to the butter mixture, stirring to blend after each. Spread the batter equally in the prepared pans and bake for 30 to 40 minutes, or until a toothpick inserted into the center comes out clean. Remove the cakes from the oven and cool them on wire racks. For Filling:Place one cake layer on a serving plate. Divide the almond paste in half and roll each portion into a 9-inch round (roll the paste between two layers of waxed paper or plastic wrap). Place one sheet of almond paste over the first cake layer. In a small bowl, mix the peach slices with 3/4 cup of the peach preserves and spread over the almond paste. Add the second cake layer and brush with the remaining 1/4 cup of peach preserves. Top with the second round of almond paste. For Frosting:Whip the cream until stiff, then add the sugar and extracts to taste, stirring to blend. Frost the cake with the whipped cream and refrigerate until serving time. If desired, drizzle a little caramel sauce on the dessert plates before putting the cake on them and garnish each serving with a few peach slices and a sprig of fresh mint. Makes 8 to 10 servings. Velveeta and casseroles. Bring it on. The makers of velveeta are inviting America to rediscover the casserole – the delicious and versatile one-dish wonder that won’t break the bank. In the South, casseroles have NEVER gone out of style, and no church supper or potluck would be complete without a slew of them. Five top bloggers are taking the VELVEETA Casserole Challenge – creating an original casserole recipe using VELVEETA that can serve four for under $10 with second helpings for the following day. Visi VelveetaCasseroleChallenge.com by Nov. 23 to vote and to see a contest that offers great prizes for consumers’ best tips to deliver delicious dinners to the family on a budget. Twenty first-prize winners will receive VELVEETA Casserole Kits and the creator of the top tip will be awarded a set of stainless steel cookware. "We know families are looking for ways to bring dinner to the table on a budget. The VELVEETA Casserole Challenge is a fun way to highlight easy, affordable meals, and remind families how much they love these cheesy, all-in-one dishes,” says VELVEETA brand manager Sherina Smith. Casseroles are an ideal way to stretch your dollar and feed the family for a reasonable price – taking the guesswork out of dinnertime. Plus, with simple variations in spices and ingredients, one recipe can become a whole recipe box full of meals. Log on to VELVEETA.com for new recipes and variations of current favorites using VELVEETA pasteurized prepared cheese product. The Manischewitz Company announces the launch of the Third Annual Simply Manischewitz Cook-Off, a cooking contest designed to encourage home cooks to prepare a simple, yet delicious kosher entrée using any of the many wonderful Manischewitz products. The Simply Manischewitz Cook-Off invites U.S. residents 18 or older to submit an original, easy-to-make entrée. All recipes must be original, must be kosher and must include at least one Manischewitz product, have no more than a total of eight ingredients and be prepared and cooked in one hour or less. For official contest details and to register, log onto http://www.manischewitz.com/ and complete the official entry form online and submit a recipe or enter by mail: Simply Manischewitz Cook-Off, c/o BHGPR, 546 Valley Road Upper Montclair, NJ 07043. Recipes entered online must be received by December 31, 2008. Mailed entries must be received by December 31, 2008. Six finalists will be selected from among all entries to compete live in New York City on February 13, 2009 at the Marriott Marquis hotel. The Grand Prize Winner will be selected on site by a panel of prestigious panel of food experts. The judging panel includes: Todd Coleman, Food Editor Saveur magazine; Melissa Roberts, Food Editor Gourmet magazine, Emily Kaiser, Food Associate Editor, Food & Wine magazine; Michael Park, Epicurious.com and Achilles Poliviou, executive chef at the Marriott Marquis. Preheat oven to 350º. Prepare a 13-inch by 9-inch glass baking dish with cooking spray. Combine sweet potato pancake mix and poultry seasoning in a shallow dish. Dredge chicken breasts through mixture, turning to coat thoroughly. Place in prepared baking dish. Place in oven and bake for 30-40 minutes or until internal temperature is 175 degrees. Meanwhile, in a small saucepan, combine apricot preserves, grape juice, garlic, and pepper. Cook over low heat until mixture is heated through. To serve: Place chicken breasts on serving platter. Drizzle ¼ cup sauce over breasts and serve remaining sauce on the side for dipping. Emory University is proud of its mission to serve sustainable, delicious food to its diners; acclaimed chef and author Virginia Willis prides herself on cooking with only the finest, local ingredients. The coupling of Emory’s mission and Virginia’s expertise is exemplified in the Heritage Harvest Feast — a Thanksgiving menu comprised of recipes from Virginia Willis’s best-selling cookbook Bon Appétit, Y’all: Recipes and Stories from Three Generations of Southern Cooking (Ten Speed Press, May 2008, $32.50) which will be served throughout all of Emory University’s dining facilities today. To celebrate the Thanksgiving holiday and in the spirit of friendship, family, and fellowship, Virginia Willis and Emory’s talented culinary team will cook soul-satisfying Southern favorites, using local produce and heritage turkeys. The daughter and granddaughter of consummate Southern cooks, Virginia Willis inherited their love of fresh, home-cooked food and unconditional hospitality before going on to become a classically trained French chef. These divergent influences inform Bon Appétit, Y’all, Virginia’s passionate homage to her culinary roots. Brimming with recipes meant for the family home kitchen, displaced Southerners yearning for a taste of home, aspiring cooks, and anyone who appreciates good food, and enhanced with stories, photos, tips, and techniques, Bon Appétit, Y’all seamlessly blends Virginia’s Southern and French roots into a memorable and thoroughly modern cookbook. Emory University's sustainability vision sets an ambitious goal of 75 percent local or sustainably grown food in the hospitals and cafeterias by 2015. A Sustainable Food Committee was named by the President in the spring of 2007 to lead Emory’s Sustainable Food Initiative. The group includes a dozen members — faculty, staff, graduate, and undergraduate students — from all across the University and has accomplished a number of projects including establishing food purchasing guidelines and defining “sustainable” and “local” food. Kids and food. Make it an adventure. I'm not the biggest fan of Rachael Ray, but she had an excellent commentary on a recent show. She was talking about preparing fast family meals and addressed a lament many parents have: Their children will eat only one or two things. As in chicken and corn. Or chicken and french fries. Her point: The children weren't born that way, so how'd their tastes get so narrow and dictatorial? Look in the mirror, mom and dad. Children eat what they do because it's what we serve them from their earliest meals. Period. It's that simple. Tell yourselves otherwise, and you're kidding yourself. Ms. Ray recalled when she was doing a cooking demonstration at a grocery and how parents would come by, see what she was cooking and answer a child's request with, 'No, you won't like that.' And these would be the same parents who'd complain that their children eat only chicken fingers. They say that if they held the line and broadened a child's menu offerings, they'd starve. Trust me. They won't starve. Once they see you're serious at taking their boilerplate dinner and adding to it, they'll get with the program. Hold the line. Sure, there are some flavors and foods people don't like. I cannot stand flaked coconut; hate the taste, hate the texture even more. I've got a friend who hates curry. There is a difference in having a few personal preferences (coconut, curry, raw tomatoes?) and being a wholesale nullifier of anything that isn't a boneless piece of chicken breast breaded and fried. Anyway, Rachael Ray's advice on how to get children to eat more than two things was an interesting discussion in how and what we eat. It's a discussion worth having, and it's truly a case of putting your money where your mouth is. For this Thanksgiving, Kopali Organics’ has created a couple vegan stuffing recipes incorporating Goldenberries to add a healthy flavorful spin on classic holiday faves. Regular stuffing can be 800 calories or more, and, speaking as a carnivore, we're thankful for every calorie. However, folks who'll be hosting vegetarians or vegans for the holiday need to spread around some culinary love. The Goldenberries are available at Whole Foods or online. Yes, that means you have to go to Mountain Brook and shop at Whole Foods, but, trust me, if you're hosting a vegan Thanksgiving blowout, you're going to end up there anyway. Bring the stock to a boil. Add the rice and salt to the stock and bring to a boil. Reduce the heat, cover and simmer for 35-45 minutes, or until the water is absorbed. Remove from heat. Heat the olive oil in a sauté pan, add the shallots and garlic and cook for about 10 minutes, or until golden. Add the mushrooms and continue to cook, stirring occasionally, until the mushrooms release their juices. Add the soy or tamari, thyme, and pepper. Continue to cook until the liquid evaporates. Transfer to a bowl with the rice. Add the golden berries, parsley and sage and toss to combine. Taste and adjust the seasonings, adding more pepper, if necessary. Preheat oven to 350 degrees. In a skillet, sautee the onion, scallions, celery, mushrooms, and vegan margarine. When browned, add the apple, parsley/sage, and salt/pepper. In a mixing bowl, combine the contents of the skillet with all remaining ingredients, stirring well.Bake for approx 25 minutes, stirring once, until crust is browned but still moist. Serves 6-8. Enjoy! When visitors come to the Southern Food and Beverage Museum , they often leave a food memory on our memory wall. Some are funny and some are sad, but all of them reflect the enormous emotional effect food has on us from the time we are young. It seems appropriate, during a season that celebrates community around the table, to share some of these memories that have been left on our wall. If you would like to reserve a seat, please email stephanie@southernfood.org.It is a great time to support the Southern Food and Beverage Museum. We are offering special discounts during until the end of the year on gift memberships to the museum. We would also like to announce our GREAT COOKBOOK SWEEPSTAKES. Each time you donate $10 online to the Southern Food and Beverage Museum, you will be entered into our weekly drawing for 2 cookbooks. We will draw weekly and the winners will be announced in this newsletter. Your donation is tax-deductible. You may enter as many times as you like. The contest ends at the end of the year. Green & Black’s is excited to introduce a new flavor to its family of organic chocolate bars. Toffee, now available to confection lovers in the U.S. , is a delectable blend of 34% milk chocolate with crisp, crunchy pieces of organic toffee. Made with the very best organically-grown cocoa beans, specifically Criollo and Trinitario varieties, Green & Black’s Toffee is crafted with masterful precision, with every step from bean to bar given equal importance. The result, an intense flavor the brand is known for and toffee pieces, prepared at just the right temperature so they please the palate without sticking. Green & Black’s Toffee shares the deep, fruity and full flavor found in all Green & Black’s chocolate while proving that the best things in the world can actually be good for it too. Green & Black’s Toffee joins the popular collection of organic chocolate flavors already available in 3.5 oz bars: Almond, Caramel, Cherry, Dark 70%, Dark 85%, Espresso, Ginger, Hazelnut & Currant, Maya Gold, Milk, Mint, and White. In addition, Green & Black’s has recently introduced special bags featuring 23 individually wrapped bite-size pieces of delicious organic chocolate. The bags are available in the popular Milk and Dark 70% flavors and are available at retailers such as CVS, Target and Rite Aid across the country. For more information, log on to http://www.greenandblacks.com/. Marinate the cherries in the brandy or port overnight, or preferably for up to 1 week, in the refrigerator. Make the coffee and while it is still hot stir in the hot chocolate and the sugar to taste. 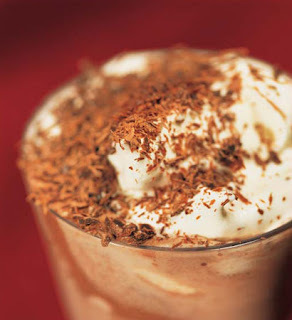 Remember not to make the mocha too sweet as the ice cream will be an additional sweetener. Chill the mocha in the refrigerator until very cold. Remove the ice cream from the freezer and let soften for 10 minutes. Pour the mocha into 6 glasses, only three-quarters full, to allow enough room for 2 balls of ice cream. Drop 3 or 4 marinated cherries into each glass and then, using an ice cream scoop, carefully drop 1 ball of vanilla ice cream into the mocha, then 1 ball of chocolate ice cream on top. Try not to disturb the ice cream too much as it will cloud the lovely dark mocha coffee. Pour 1 to 2 tablespoons of cream over the top of the ice cream and then sprinkle some cocoa or dark chocolate flakes over it. Serve immediately. With an increasing number of Americans firing up their barbecue grills year round, outdoor grill usage is currently at an all-time high – nearly double what it was 20 years ago, according to NPD’s 22nd annual "Eating Patterns in America" report. “At-home grillmasters” now have the opportunity to put their skills to the test and win a $5,000 backyard makeover. The Crisco Sprays Grilling Hall of Fame contest is inviting grillmasters to share their favorite recipe for a chance to be one of the first inductees into the new Hall of Fame and win a backyard makeover. Recipes can be submitted until Dec. 15, 2008, at www.GrillingHallofFame.com. Take a picture and send it in. According to the American Dietetic Association (ADA), olive oil is beneficial to the heart. It contains monounsaturated fat, which can help lower LDL, or bad, cholesterol. Additionally, the Food and Drug Administration (FDA) advises that consuming just two tablespoons of olive oil per day may reduce the risk of heart disease. With all the health benefits to using olive oil, there’s just one thing left for consumers to figure out – which one to use. · Light. This is ideal for baking and cooking when you don’t want a strong flavor but still want all the health benefits. Light olive oil has undergone a filtration process that leaves it with a lighter appearance and flavor, although the calorie count remains the same. · Extra virgin. If you only plan to have one olive oil on hand to use as an all-purpose type, this would be the one. It’s low in acid and has a fruity flavor and aroma. It provides a lot of flavor, even when only using a minimum amount. This type of oil works well for sauces, frying, marinades, meat, fish, pasta, vegetables, and baking. It’s also the variety most commonly used when consumed cold, with salads or for dipping bread. When it comes to storing olive oil, it’s best to keep it either in the refrigerator or in a cool, dry place. If it’s being stored in the refrigerator, it may thicken and it will need to sit out for a few minutes before being used, so that it can liquefy again. Olive oil is sensitive to heat and light; exposure to them can speed up the process of turning it rancid, so it’s important to store it in a dark area that is temperature-controlled. Shelf life once it is opened varies, but most manufacturers recommend three to six months. Olive oil can be used as a substitute in most recipes that call for vegetable oil, shortening, or butter. · Eat 4-5 small meals during the day. · Eat whole foods, over processed ones. · Avoid simple sugars and processed flour. · Nosh on a nutritious and filling small meal before you leave for a holiday party. · Drink at least 12 ounces of pure, fresh water before each meal (your stomach won’t know the difference between fullness created from water or food!). · Scan the buffet table first before making food choices. · Choose the high protein foods first, things like fish and meats. Eat that plate first, then return for carbohydrate foods such as potatoes and stuffing. We've got a pumpkin explosion going on in Wednesday's Anniston Star. We're rescuing pumpkins from the prison that has become the Halloween-Jack-o-lantern-Thanksgiving centerpiece triangle. We're actually turning them into real -- REAL -- food. I often rant about under-appreciated vegetables, and pumpkins are up there. They're loaded with vitamins and minerals, and they're super simple to prepare. Our recipes are a little more elaborate, but Monday night, I pureed some pumpkin with a little butter, a pinch of salt, a good dusting of pumpkin pie spice and whipped it with my hand blender. No finer sauce could have accompanied the fried pork chops I served. Here's a taste of what's in Wednesday's paper, along with Prudence Hilburn's Gourmet Touch and Pat Kettles's wine picks of the week. Enjoy. Life's too short to eat bad food. Butter a 10-inch springform pan and wrap the outside with aluminum foil. In a separate mixing bowl, lightly beat the eggs and yolks until light and frothy. Add the granulated sugar and whisk eggs until pale and fluffy. Slowly stir a small amount of egg mixture into the cooled milk mixture; do not rush the process or the eggs will curdle. Whisk in the pumpkin, ginger and salt. Preheat oven to 325 degrees. Dunk each slice of bread into the egg custard and then, slice by slice, arrange slices in the springform pan, overlapping the layers. Slowly pour the remainder of the mixture into pan. You should have at least 1/3 to 1/2 of the egg mixture left. Let sit30 minutes. Place the springform pan inside a roasting pan. Fill the roasting pan with hot tap water until it reaches about halfway up pan sides. Bake about 90 minutes until the center is firm but not hard. During the last 10 or 15 minutes, sprinkle about 1/4 cup of brown sugar on the top and raise the oven temperature to 400 degrees. The finished product should have a consistency similar to a quiche. Use a toothpick to check for doneness. Allow the French toast to cool about 20 minutes before sliding a knife around the edge of the pan to unmold. Garnish with whipped cream and a sprinkle of raw sugar or dusting of confectioners’ sugar. For the ravioli: In a large mixing bowl, combine pumpkin, ricotta, Parmesan, mozzarella, parsley, sage, nutmeg, salt, garlic powder, white pepper and brown sugar and mix well. Place 1 heaping tablespoon of the filling between two wonton wrappers, dampen edges by moistening fingers with water and running along the edges and seal well. Drop ravioli into salted, simmering water; remove when ravioli floats to top, about 3 minutes. For the sage butter: Melt butter in a saute pan over medium-high heat. Add sage leaves and minced garlic; saute for about 30 seconds. Slowly add chicken stock. Add salt and pepper to taste. Drizzle sage butter over ravioli and garnish with freshly grated Parmesan. Preheat the oven to 325 degrees. In a small bowl, mix the cinnamon, allspice, ginger, cloves, salt and pepper together and rub chicken legs with spice mixture. Heat oil in a large, heavy-bottom pan over medium-high heat until oil starts to shimmer, then sear chicken in two or three batches about 10 minutes on each side or until the skins are well browned. Remove chicken and place in an oiled, 8-quart covered casserole dish. Add the garlic and onion to the pan used for cooking chicken and saute until soft. Add the chicken stock, honey, pumpkin, dates, beets, parsnips and bay leaves to pan and bring to boil over medium-high heat. When the mixture comes to a boil, pour over the chicken legs. Cover the dish and braise in the oven 45 minutes or until chicken and root vegetables are tender. Season to taste and serve over the couscous. Preheat the oven to 375 degrees. Grease a 15- by 10- by 1-inch baking pan and line with wax paper. Grease and flour the paper and set pan aside. For the cake: In a mixing bowl, beat the eggs on high speed with a hand mixer 5 minutes. Gradually beat in granulated sugar until batter is thick and lemon-colored. Stir in pumpkin and lemon juice. In another bowl, combine flour, cinnamon, baking powder, salt and nutmeg. Gently fold dry ingredients into the pumpkin mixture. Spread batter into the prepared pan and sprinkle evenly with walnuts. Bake 15 minutes or until cake springs back when lightly touched. 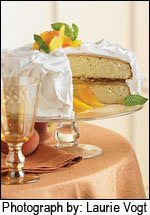 Immediately turn sponge cake out onto linen towel dusted with confectioners’ sugar. Peel off wax paper and roll cake up in a clean kitchen towel, starting at the short end; allow to cool. For the filling: In a mixing bowl, beat the cream cheese, 1 cup confectioners’ sugar, butter and vanilla on medium speed until fluffy. When cake is cooled, carefully unroll cake and spread filling to within 1 inch of the edges. Roll up again. Cover and chill until serving. Slice and dust with confectioners’ sugar to serve. Pumpkins should be our national fruit. After all, they were served at our first communal dinner enjoyed by the American Indians and Pilgrims. Or maybe it was the second; history is a bit unclear. There is something about pumpkins that is distinctly American. After all, Indians were eating pumpkins in a variety of ways years before the Pilgrims landed. The original pumpkin pie was created by colonists when they cut the top off, removed the seeds for other purposes, and filled the pumpkin shell with honey, milk and spices before roasting it over an open fire. This, by the way, sounds fabulous and someday I will try it. Chef Steve’s tip: You can use pumpkin, butternut squash or any favorite hard squash for this recipe. If you like a richer flavor, add a pat of butter while mashing. Combine the squash, apples and olive oil in a large mixing bowl; toss to coat. Place in a baking dish. Add water, cover with foil and bake 45 minutes until tender. In the meantime, combine the milk, vanilla, cinnamon and maple syrup in a saucepan. Heat over low and bring to a simmer; set aside. Transfer the baked squash and apples to a mixing bowl. Slowly add the warm milk mixture as you mash with a potato masher or a fork. Mash until well combined. Season with salt and pepper. Makes 4 servings. Dress these up if you wish with vanilla or cream cheese frosting or serve with whipped cream or ice cream. This recipe produces a cake-like texture. If you prefer a chewier bar, reduce eggs to 2. Heat oven to 350 degrees. Grease a 9-by-13-inch pan. Beat the pumpkin, eggs, oil, brown sugar and vanilla until light and fluffy. In a separate bowl, whisk the flour, salt, baking powder, cinnamon, ginger, nutmeg and cloves. Gradually stir the dry ingredients into the pumpkin mixture, stirring just enough to combine evenly. Fold in the raisins and pecans. Pour batter into prepared pan. Bake 25 to 30 minutes, or until toothpick inserted in center comes out clean. Serve warm or cool. Makes 32 squares. In a 2-quart or larger saucepan with a lid, saute onion in butter until just golden. Add rice and cook 2 minutes, stirring to keep it from sticking. Stir in 1 cup of the stock. Stir in the pumpkin puree and bring just to a boil. Reduce heat to medium and cook, stirring often, until all the liquid has been absorbed. Continue adding stock, 1/2 cup at a time, simmering and stirring, until rice is tender and liquid is absorbed, 15 to 20 minutes. Stir in the half and half (the consistency should be creamy but not soupy) and season to taste with salt and pepper and any optional seasonings. Just before serving, stir in the chives and Parmesan. Makes 8 servings. In a stew? Find a bird near you. While beef is considered the King of Stews, chicken-based stews come together fast and offer a nice change of pace. A method of cooking by which meat and vegetable combinations are barely covered with liquid, stewing produces deep flavors because the foods simmer slowly in a tightly covered pot. Stewing tenderizes meat and allows the flavors of the individual ingredients to meld deliciously. From the National Chicken Council and the U.S. Poultry & Egg Association, here are two chicken stew recipes to add to your winter meal list, during the holidays or anytime for casual family dining. 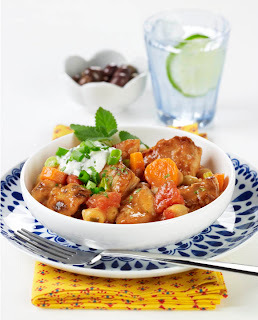 Spicy Chicken and Chickpea Stew combines rich chicken thigh meat with carrots, scallions, tomatoes and chickpeas. Chicken stock and orange juice provide the juices for the stew, with additional flavor layers provided by garlic, coriander and paprika. To make this tasty, easy dish, start by slicing chicken thigh meat into bite-sized chunks. Brown the chicken on the stovetop, and then boil chicken stock and orange juice together in the same pan. Add the vegetables and cook until crisp-tender. Put the chicken back into the pan and let the stew simmer to meld the flavors. A dollop of herbed yogurt is cooling, tasty finish to this dish. Serve with a green salad and crusty bread for a complete meal. In small bowl, combine all ingredients for Herbed Yogurt. Refrigerate to allow flavors to blend. Place flour in plastic bag with zipper top. Add chicken; toss to coat. In large pan with lid, warm oil over medium-high heat. Add chicken and sauté until browned, about 5 – 7 minutes. Remove chicken to a bowl and set aside. In same pan, pour orange juice and chicken stock. Bring to a boil, scraping up any brown pieces from the bottom of the pan. Add scallions, carrots, garlic, coriander, paprika and salt. Reduce heat to a simmer and cook, stirring occasionally, until carrots are crisp tender, about 10 – 15 minutes. Add tomatoes and chicken, return to a simmer and cook until chicken is cooked through, about 15 minutes longer. Remove from heat. To serve, spoon into bowls and top with dollop of Herbed Yogurt. 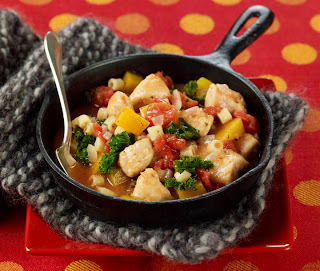 Chicken, Squash and Pasta Stew is an easy one-dish meal, perfect for a busy night. Slice chicken cutlets into bite-size pieces and cook on top of the stove with diced onion. Add thyme, oregano, basil and a bay leaf for flavoring, along with chopped butternut squash, canned diced tomatoes, small elbow pasta and bagged spinach leaves. Cook into a stew with red wine and orange juice. Serve in soup bowls topped with a sprinkling of Parmesan cheese. In large frypan with lid or stockpot, warm olive oil over medium-high heat. Add onion and sauté until translucent, about 5 minutes. While onion is cooking, place chicken pieces in colander over sink, sprinkle with flour and toss to coat. Add chicken to the pan and brown, stirring occasionally, about 3 minutes. Add thyme, oregano, basil, bay leaf and tomato paste; cook one minute, stirring constantly. Raise heat to high, add wine and scrape up brown bits from the bottom of the pan, cooking another minute. Add squash, tomatoes, orange juice and chicken broth. Bring to a boil, cover, reduce heat to a gentle simmer and cook until squash is beginning to soften, about 7 – 9 minutes. Add pasta, stir, cover and simmer an additional 10 minutes. Add spinach a handful at a time and continue to simmer another 3 – 4 minutes, until greens are beginning to wilt and stew is cooked through thoroughly. Season with salt and pepper and stir well. To serve, ladle into soup bowls and top with sprinkling of Parmesan cheese. In a 4-quart saucepan, bring 2 quarts hot tap water to a boil over high heat. Add the potatoes and onions, return to a boil, reduce heat, cover tightly and simmer 14 minutes or until potatoes and onions are tender. Drain well in colander. Add the potato mixture, plus the other ingredients to the saucepan and use a potato masher or electric mixer to mash until smooth. Grate 2 teaspoons rind from the lemon, cut the lemon into wedges. Melt Smart Balance Butter Blend Stick over medium heat in a large nonstick skillet. Add the breadcrumbs and cook 2-3 minutes, or until just golden, stirring constantly. Remove from heat; add lemon zest and 1/8 teaspoon salt. Stir gently, using the back of a spoon, incorporate lemon zest into the breadcrumb mixture, set aside on separate plate. To the skillet, add the water and asparagus, bring to a boil over medium high heat, cover and boil 2 minutes or until tender crisp. Drain well. Place asparagus on serving platter. Sprinkle with 1/8 teaspoon salt and top with the breadcrumbs. Serve with lemon wedges. * Panko bread crumbs are Japanese bread crumbs found in the ethnic section of most major supermarkets. May substitute with 1 1/2 ounces multigrain bread torn in small pieces, placed in blender and pulsed to a fine crumb texture. First Layer: Stir together dry ingredients. With pastry blender, cut in Smart Balance® Butter Blend Stick until pieces are size of peas. Add eggs and vanilla, mix well. Press dough onto bottom and sides of ungreased 10 ½ x 15 ½-inch jelly roll pan.Second Layer: Bring water and sugar to a boil and stir until sugar is dissolved. Add cranberries and cook on low heat for 10 minutes, stirring occasionally. Cool. Mixture will thicken as it cools. At Taste of Home, getting into the holiday spirit begins in the kitchen and continues in the community with acts of kindness. Against the backdrop of our country’s tough economic conditions, the editors at Taste of Home are declaring the second week in November National Cooks Who Care Week -- to celebrate the generosity of those who are giving back through food-related efforts. The 1st Annual National Cooks Who Care Week will be marked through a variety of Taste of Home avenues from Nov. 10 – 16. Tasteofhome.com will serve as the hub for the weeklong celebration, highlighting stories of people giving back and offering ideas and tips on how to get involved in a food-based volunteer effort. Taste of Home Cooking Schools throughout the country will host canned goods drives benefiting area food banks. Taste of Home staff and field editors will engage in multiple community efforts such as serving hot meals to needy families, organizing bake sales to raise money for charities and donating to food banks. By establishing the 1st Annual National Cooks Who Care Week, Taste of Home is reaching out beyond its reader base and inviting others to join in this unique outreach opportunity. near opening. Makes 6 desserts. occasionally, until the sugar is dissolved. Add the pears and cook for 10 minutes or until the pears are tender, turning occasionally. reduced to about 3/4 cup. Remove the vanilla bean and scrape the seeds into the sauce. 400°F. Line a baking sheet with parchment paper. with 1 pear and garnish with raspberries. the stem intact. Cut a thin slice from the bottom of each pear so that it will stand upright. turnovers with the sauce. Top with the whipped cream, if desired. package directions. Reduce the oven temperature to 350°F. Bake for 1 minute or until the candy melts. Divide the topping among the shells. Serve immediately. to handle. Heat the oven to 350°F. Line 2 baking sheets with parchment paper. baking sheets. Brush the tops of the pastries with the egg. sheets for 2 minutes. Remove the pastries to a wire rack and letcool. to melt. Stir until the chocolate mixture is smooth. Stir in theconfectioners' sugar. desired consistency. Drizzle the icing over the pastries.